Are you stressing about your monthly bills? 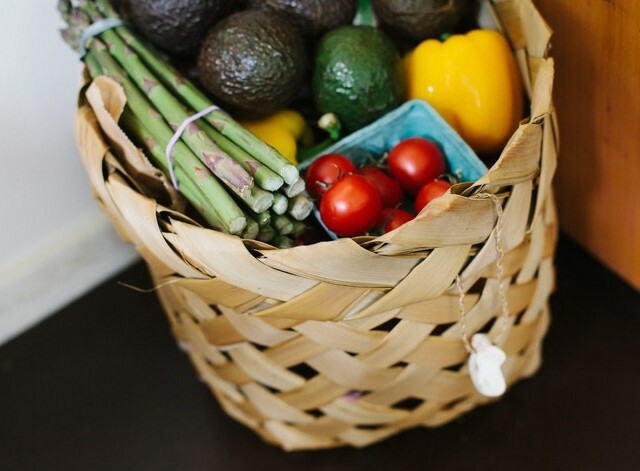 With the cost of living going up, are you finding that the grocery bill is really weighing down your finances? This is the position I found myself in not too long ago. I had just moved out of my parent’s house, I was still learning to budget, and I quickly realized that the cost of living was a lot higher than I had expected. It definitely gave me a lot more appreciation for what I’ve had, and lent perspective on what many people have to struggle with. I knew that I needed to find ways to save money every way that I could! Essentially, Ibotta is a free app that you can download onto a smartphone, that will give you money back on your groceries. I searched for quite a while, trying to find an app like this that would actually be helpful. I initially tried an app called Shopkicks. It awarded points for buying specific groceries, that could eventually be exchanged for small gift cards to stores like Amazon. I quickly realized that there were VERY few products that even qualified for a rebate, the amount of points necessary to cash out was HUGE, and the size of the rewards was tiny. Luckily, my discontent motivated me to keep looking, and I found Ibotta. Ibotta is actually connected with several hundred different stores, that you can shop at both online or physically. It includes not just groceries, but pharmacy items, clothes, beauty/personal care products, flowers, and even money back on purchases on Amazon, Ebay, Etsy, Best Buy, Cabela’s, etc. And it pays you in actual dollar amounts! What you see above is just a screenshot from my phone of what it looks like. As long as you have an Android or iPhone with a working camera, the app can scan the bar codes on whatever groceries you’re purchasing. If the products are on Ibotta’s list you can get cash back on them. You also need to save your receipt so that you can scan it too, before throwing it out. Ibotta is as simple as that! There’s a very large variety of brands that qualify for rebates with Ibotta. It can be anything from a frozen pizza to a bottle of hair gel, and the qualifying brands are cycled, so they are not always the same. Inevitably, there will always be some grocery items in a weekly grocery trip that count. Ibotta will generally pay better for brand purchases. They can afford to be a completely free app because brands pay them, so Ibotta will give back more generously on brand purchases. This doesn’t mean that generic or store-brand purchases will never qualify! 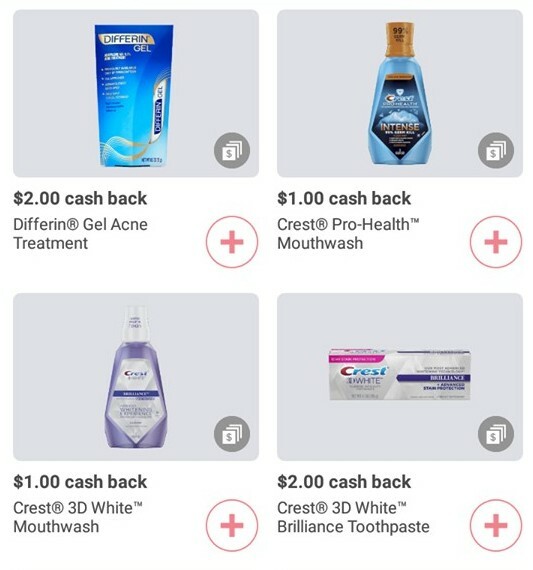 Every month, Ibotta rolls in a variety of “Any Brand” offers, that will give you some cash back on certain products, whether it’s a brand they have available or not! 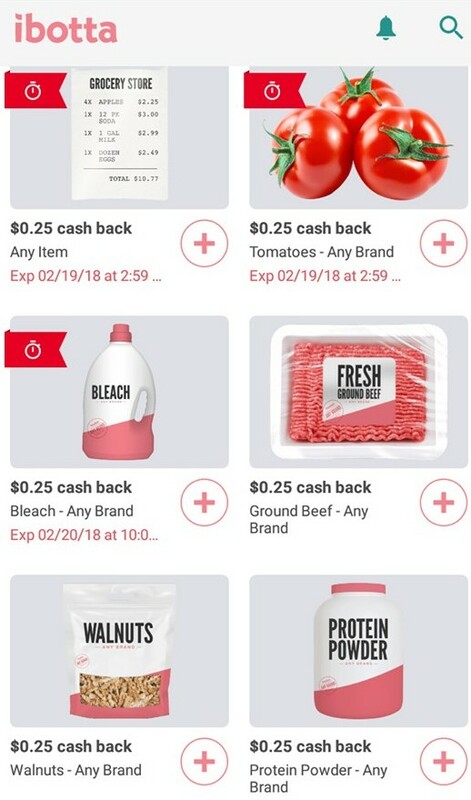 You can see from this screenshot, there are always products that you can purchase from any brand when you are grocery shopping, and get $0.25 back on each. These are sometimes on things like bleach and protein powder, but are most common on everyday purchases like eggs, milk, and bananas. This makes it especially useful! Bear in mind (and I’ll mention this again), don’t purchase more expensive brands than you normally would just to qualify for cash back! This defeats the purpose, because the goal is saving! When I first started using Ibotta, one of my first concerns is that my local grocery stores would not be available with Ibotta. The good news is, there’s an INSANE number of grocery stores that are available on Ibotta, all over the United States (unfortunately, it’s only available in the U.S. and Puerto Rico at this point). This includes: Walmart, Kmart, Kroger, Wegman’s, Price Chopper, Weis Markets, Shop ‘N Save, ACME, Food Lion, Food Giant, Harvest Market, Dollar General, Family Fresh Market, Winn-Dixie, Tops, Target, Trader Joe’s, Costco, Sam’s Club, and Meijer…. just to name a few. How Much Money Can You Make With Ibotta? This is a screenshot of my earnings so far with Ibotta. And I’ve only been using it for a couple months! Also bearing in mind that this doesn’t include another $20 that my wife received last week. That’s over $55 in savings in about 2 months, sent through PayPal into our bank account. This may not seem like much, but saving around $240 a year just by reducing your grocery expenses with a free app is a good way to cut costs! 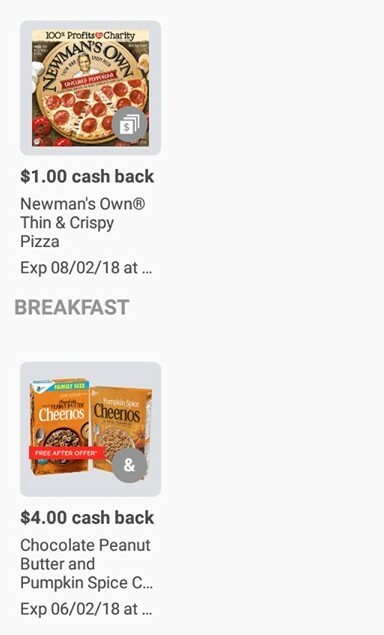 It can also be used in addition to coupons (it feels good to get a $3 item for free). And this current amount is only from buying our weekly groceries (and a pair of slippers)! You can see below, adding in toiletries and hygiene products results in higher rebates, averaging around $2.00 per item. To sum up, these are the pros and cons that I’ve narrowed down, since using the Ibotta app. Pays in clear dollar amounts. Not points. Can be used on top of coupons. This is just one way that you can save money on your regular expenses. If you’re interested in other easy and free ways to save money fast, check out this list. If you are looking for more lucrative ideas for actually building income online, I would recommend looking HERE. Thanks for the great information on the Ibotta app. It really helps that you did all the leg work to minimize the hustle for someone who is looking to a decent rebate program. The question for me is always whether or not the hustle is worth the saving. great to save 20 bucks a month, question is what does it take to do that. I gather from what you write that this one is a worthwhile app and I shall look into it. I definitely agree, the ONLY rebate programs, or really any other free money-maker online that are worthwhile, are the ones that are quick, and easy. Ibotta is really simple. It literally only takes me about an extra 2 minutes after unpacking my groceries. Compared to something like a survey site, that’s especially efficient. You can just do your regular grocery shopping, open up the app, hit the scan button on the app, and a camera will pop up that you can hover over the barcodes on your groceries. Takes about 2 minutes or less, depending on the amount of eligible groceries. I came across your site looking to save money on my grocery bill. Having a family of 5, 4 of which are male or grocery bill comes with a hefty price tag. My question for you is do you feel shopping online, apps or in store shopping is the cheapest alternative. Oh wow, that’s understandable! I’m not too far out of my teen years, and I always felt bad for how quickly I made the groceries disappear. Ibotta will give you rebates regardless of how you shop – online or in store. What’s cheaper, grocery shopping online, or in store. That actually depends on a few factors. If the grocery store is a bit of a drive, the price of shipping you’d have with online shopping would be made up by the savings in gas. It’s also more time-efficient to grocery shop online, there’s less risk of impulse buying (like spotting things you really don’t need, but kind of want), Some bigger grocery stores, like Walmart, may even give you free shipping on large enough orders (say $45 or more). You also have an easier path to using coupons. Coupons can help a lot. My face wash, for example, costs about $4. I had a coupon for $2 off, and Ibotta gave me a rebate of another $2. I essentially got the face wash for free, with little effort. If you shop online, I highly recommending doing it through Ebates, if you don’t already. Again, it will give you cash back on the stuff that you buy from stores like Amazon and Walmart. (Just got $10 back on Valentine’s Day flowers myself). The downsides to grocery shopping online, as opposed to in-store, are these: you usually can’t get frozen or perishable food through the mail. Especially on 2-day shipping. And if you aren’t the one hand-picking your produce, they don’t always pick very discerningly. My Mom tried online grocery shopping for a while, and had trouble getting accurate enough products when they delivered. So the truth is Ken, it’s really a toss-up. You can compare and contrast the two, but ultimately I think it’s pretty even. Thank you for this review. I do notice that many rewards programs only apply to certain products. It is like we have to tailor our shopping habits to fit those types of apps. Since I already know what I like to eat, I’m not going to change my shopping patterns to fit an app. With ibotta, it is apparent that I can still purchase the things I love, while also saving money. The fact that it pays back on brand purchases (usually better anyway) is particularly helpful. Thanks again. Hi Ernest, thanks for dropping by! I feel the same way about a lot of rebate options and rewards programs. Some of them are fantastic (like the Shell Rewards program at https://www.fuelrewards.com/fu… which gives me money back on the gas I need anyway), but rebate apps and websites are only really useful if they are getting you money back on things that you buy anyway. You still need to make sure you’re not going for most expensive items just to qualify, but there are definitely a good number of options on Ibotta. I’ve found it really helpful. I am always interested in saving money. Guessing you are a retiree which I am as well. The earnings percentage wise are pretty good. You showed a few foods are their more available? That would be really what I would be interested in. Sounds like you are off to a good start. What is the thing you learned most from the experience? I’m interested in saving money as well. I’m actually not retired – I’m 23 and self-employed, and working on creating several flows of residual income (I sell insurance, for one. Running an online business for another). I also help people with investing ahead of time for their retirement. So the goal is making an early retirement and a free schedule possible, but I’m still in the midst of it myself. Ibotta is helpful. It definitely varies in terms of the savings. The screenshots that I displayed were only a few, but there is a vast list of different foods that you can get rebates/money back on. It changes from month to month. Ground meat, Newman’s dressing, Chex cereal… you can scroll through the app after signing up and see a whole bunch of different things! The thing I learned most from discovering and using Ibotta is that the more you can reduce costs on daily living expenses the better! And there are many, diverse ways of doing this. Thanks for dropping by :)! Hi Clay, I’m glad it helped! Ibotta is very cool! I have the app on my phone and I can absolutely vouch that it can save you on groceries. It’s not something that will replace a full time income or a side hustle I’d try to get rich off of, but it’s a great tool to lower grocery costs. Great review on this useful product! And thanks for your encouragement :). Like you said, it’s definitely not a part-time job or a source of income, especially because you have to be buying something to get cash back. If you aren’t responsible for household purchases, like groceries, it won’t be as useful. It’s about saving money, but if you think about it, getting $20 back is not too different from making $20. I’m glad Ibotta has worked out well for you! 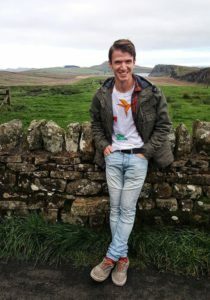 What a great review and write up of the Ibotta app. 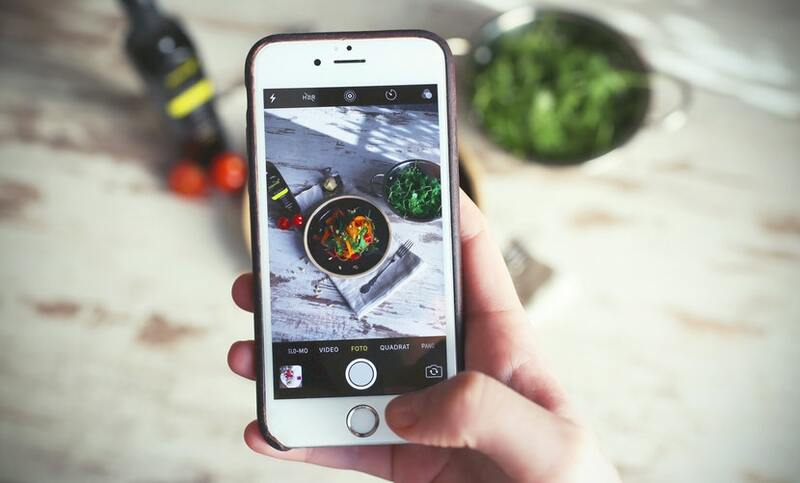 I’ve looked at numerous apps over the past year or so for things that would add a little cash back or give rebates or pay me to take surveys or post my photos’ online for money and on and on and on. And since you’ve “been there, done that” you can completely understand where I am coming from. 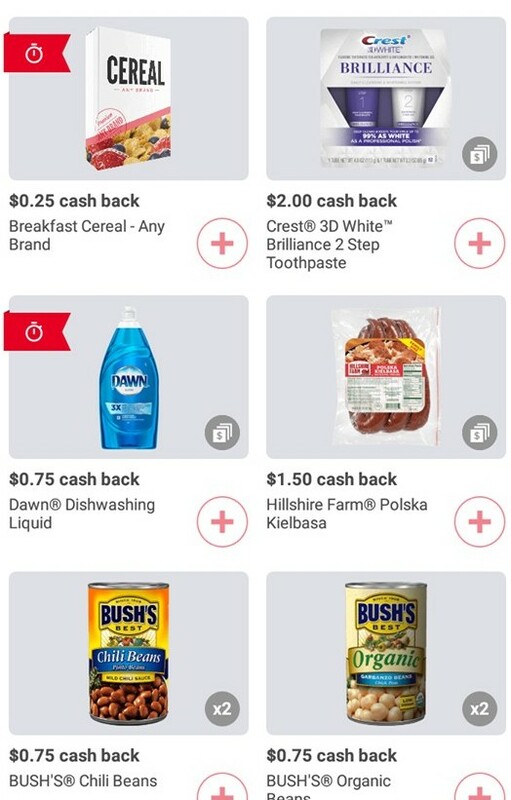 This Ibotta app seems like a great and intuitive tool to provide cash back on stuff I’m gonna buy anyway, groceries. I do the shopping my house and use Price Chopper right up the road so I’m going to take this app for a spin soon. I’d also love to hear what other great tools and apps you’ve got in store – thanks! Hey Mat A.! I’m glad you found it helpful! I’ve definitely been on the hunt for the same kind of thing, I relate to where you’re coming from. It took me quite a while to finally find the things that work, and are bringing in actual money or savings. Definitely try out Ibotta, and join my team through my link if you want! We can help each other get bonuses in addition to our regular savings (for example, if we save $10 in March between the two of us, they’ll give us each an extra buck). I’ll definitely be writing a review for Ebates soon, as well! It’s another great tool. Thanks for dropping by! I heard about this program and I really loved it. Sadly enough, I am not from the United States but would really love to take part in something like this. Is there any other program you know that serves the whole world which works like ibotta, would help me make money, and it’s legit? Unfortunately many of these apps are difficult to find outside of the U.S., and I do not have a lot of knowledge about which ones are available outside of the states. I know that Checkout51 (which is similar to Ibotta) is also available in Canada, at least. You may also want to check out SavingStar, BerryCart, or even Shopkicks, in case they have more availability. Hi, Jordan! Being fairly familiar myself with the Ibotta App, (including previously conducting my own review) I concur with what you stated. This particular App, is so much better than similar products put out by companies. Really, and as seen in other shopping Apps, who wants to be rewarded by getting points that would count towards the purchase of gift cards and other such nonsense when the true goal should be for that individual to actually get cold, hard cash coming back to him/her? What would be the point, after spending money shopping done through an App to be rewarded with a dining gift card in which you’d have to spend money to eat at the particular establishment in the first place, though receiving a discount off of the check? You also mentioned, an absolute fact that more brand products are partnered with the Ibotta App, compared to others that are offered by rival companies. Again regarding the other Apps what would be the point in using them when, by comparison to the Ibotta App, less than a third of the brands would be aligned with the former? We all have to save money somehow when it involves food shopping. It just makes sense to use an App that is recognized by so many brand companies to help save money, getting rewarded at the same time. Hey Jeff, thanks for your support! I couldn’t agree more, after trying a bunch of different cash back apps to save money on groceries. I have also tried Checkout51 and some others, but I have yet to find anything that has nearly as many offers and opportunities as Ibotta. And like you said, having actual cash sent to your bank account or through the mail is so much better than just getting a gift card to buy more stuff. A lot of programs basically get you to keep working for them by using those kinds of rewards. What are some other cash back opportunities that you’ve found really helpful?? Hello Jordan, I just read your post On Ibotta. I had never heard of the program but it got my attention. I have been using Wal-Mart’s Savings Catcher for a few years and I am a big fan. It is super easy to use and I average about $100 in savings a year. But I am all about saving money, so the long and the short of it is I just signed up for Ibotta through your website. I am looking forward to saving even more money in the future. Thanks and take care. Hi Mike, thanks for signing up! Our combined savings will get us bonuses! I’m also really interested in the Wal-Mart Savings Catcher. Walmart is probably the best store to use on Ibotta, and I tend to do a lot of grocery shopping there. 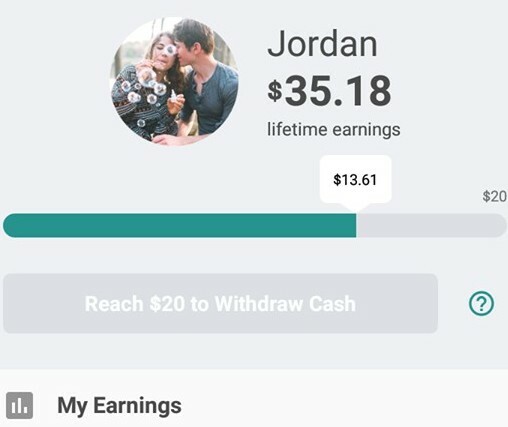 Is there a referral link I can use to join up to your Walmart Savings Catcher? Or is that not how it works.